The center is located on the grounds of Historic Corolla Park. Sharon Meade, the centers curator and public relations liaison said the setting is perfect. "It's a beautiful setting of 29 acres of oak trees, and families can stroll the grounds and even bring a picnic while they enjoy the view and the setting before or after visiting the center." One of the key displays is a massive living aquatic ephemera of fish, native to the region, housed in an 8,000 gallon aquarium where families can get up close and personal with a rich variety of finned swimmers. "You have to remember we have a variety of marine eco-systems here. The ocean, the sound and an estuary so it is pretty diverse." "We were known as the sportsman's paradise, especially in regards to duck hunting, and it is historically ingrained in the lifeblood of the region. We have a large collection of collectible and artistic antique waterfowl decoys to prove it. I think there are over 200 on display. Also, Ducks Unlimited got it's start in the area way back when," she explained. If you want to step back in time, they have a duck blind display set up in a simulated salt marsh to revisit the old days when hunting was the sport of kings and province of exclusive hunt clubs, such as the Whalehead in Historic Corolla located next door to the center. A film presentation, "Life By Waters Rhythms" is shown at regular intervals to transport you on a celluloid journey through the natural and cultural history of the region. Motorboat aficionado's will think they have died and gone to outboard motor heaven when they peruse the centers delighful and definitive display of vintage outboard motors, which to the outdoors person has the same appeal common to car buffs going to a classic car show. "The outboard motor display has become somewhat of a nostalgia attraction. When people see a particular motor for example, they say, 'My grandfather had one just like that', so the appeal of the display is universal in that regard. We currently have 22 of them on display at the center and they truly are works of art," explained Meade. Nature lovers can't visit a Wildlife Center without making a stop at the in-house gift shop. Merchandise that celebrates and educates about wildlife is as abundant as a flock of geese flying to winter in Currituck during hunting season. The shop has a large selection of books, nicknack's, periodicals, posters, clothing and wildlife art in various forms to adorn home or office. The best part of the center for kids? Easy answer according to Meade. "It has to be Banks the Bear. It's a stuffed black bear in the lobby and kids can pose with him and love to touch him. We had a naming contest and "Banks" for Outer Banks, won and was the name given to him. Once you've taken in all the center has to offer, your adventure in the area's cultural history continues when you visit the Currituck Beach Lighthouse next door. The keepers house is Victorian in style, and was home and hearth to keepers throughout the 19th Century and into the 20th when, just as the horse and buggy, hands-on lighthouse maintenance went into the dustbin of history when automation took over of most of the functions. The old light fell into disrepair and was subject to vandalism but by the Eighties a restoration project got underway, and although not quite complete yet, it is open from Easter through Thanksgiving as a Museum Shop with with models of Outer Banks lighthouses, books and other nautical items. We are talking wildlife here, and the wildest species you may encounter are the banker horses. These wild mustangs are direct decendents of horses brought over by the Spaniards centuries ago that have thrived in the wilds of the Outer Banks. According to Karen McCalpin, Executive Director, Corolla Wild Horse Fund, much still has to be done to protect them. "The wild horses of Corolla have lived on the Outer Banks for nearly 500 years. Development as a resort area began in earnest in the 1800's. Horses were pushed south and north of Nags Head. Up until the mid 80's, anyone who wanted a horse just captured one. As a result, many of the horses with the most colorful markings were sold off," she explained. "The US Fish & Wildlife Service still considers wild horses as an exotic, invasive species and has been trying to force us to comply with an outdated management plan that calls for a maximum herd size of 60. Sixty will cause a genetic collapse." In order to see the wild horses now, visitors can rent a beach home in the four-wheel drive only area, drive on the beach for a day trip, or take one of the commercial horse tours. There is plenty to do and to learn at the Outer Banks Center for Wildlife Education and Heritage Park. Admission to the Center is free, although donations are accepted, and appreciated. Open daily from 9 a.m. to 5 p.m., all exhibits are wheelchair accessible, they even provide hearing assistance devices for the hearing impaired. The center is located at 1160 Village Lane in Corolla. Visit their website at NC Wildlife Commission. It's a great family odyssey to explore the coastal region and North Carolina's, wild, wildlife! Don't forget to say "hello" to Banks the Bear! What is the Outer Banks Center for Wildlife Education? 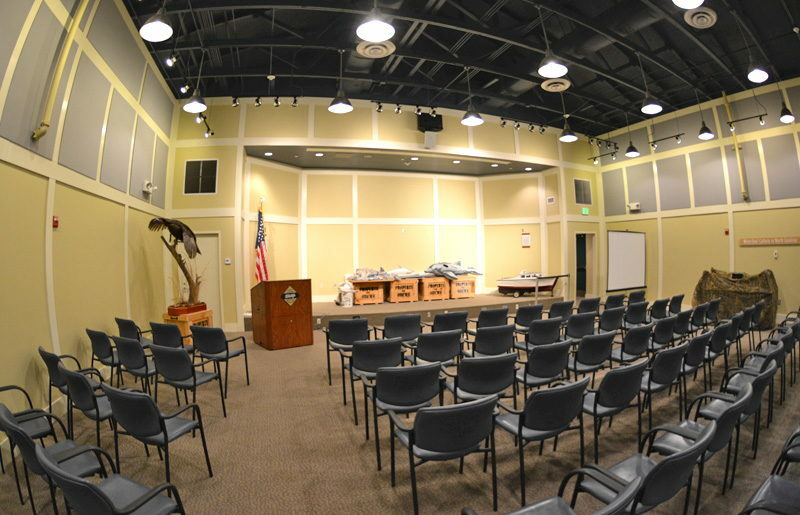 The Outer Banks Center for Wildlife Education is an educational facility which explores the wildlife of coastal North Carolina. Managed by the North Carolina Wildlife Resources Commission, the site features both indoor and outdoor attractions, special seasonal programs for visitors, and a wide range of exhibits within its 22,000 square foot center in the heart of Corolla. Where is the Outer Banks Center for Wildlife Education? The Outer Banks Center for Wildlife Education is located in the town of Corolla, and is sandwiched in between two popular northern Outer Banks attractions – the Whalehead Club and the Currituck Beach Lighthouse. How do you get to the Outer Banks Center for Wildlife Education? Visitors can take NC Highway 12 north to the town of the Corolla to reach the Outer Banks Center for Wildlife Education, which is located off of Village Lane, and is within strolling distance of the Currituck Beach Lighthouse, Historic Corolla Park, and the Whalehead Club. How much is admission for the Outer Banks Center for Wildlife Education? Admission to the Outer Banks Center for Wildlife Education is free, although donations are accepted and appreciated. There may also be a small fee to participate in some of the events and programs at the center. Who manages the Outer Banks Center for Wildlife Education? The Outer Banks Center for Wildlife Education is managed by the North Carolina Wildlife Resources Commission. When is the Outer Banks Center for Wildlife Education open? The Outer Banks Center for Wildlife Education is open year round, generally from Monday until Friday or Saturday, depending on the season. The center is closed on Sundays and on some state holidays. How big is the Outer Banks Center for Wildlife Education? 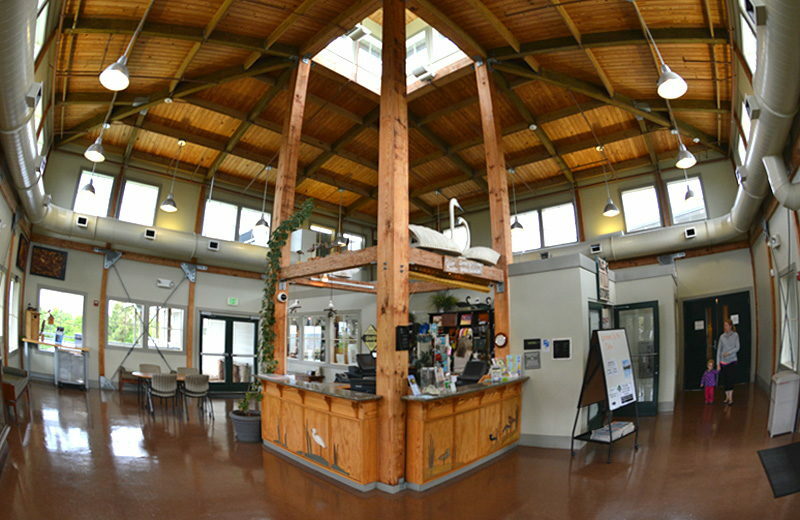 The Outer Banks Center for Wildlife Education sits on a 29 acre site, and the center itself is an impressive 22,000 square feet. What are the exhibits at the Outer Banks Center for Wildlife Education? 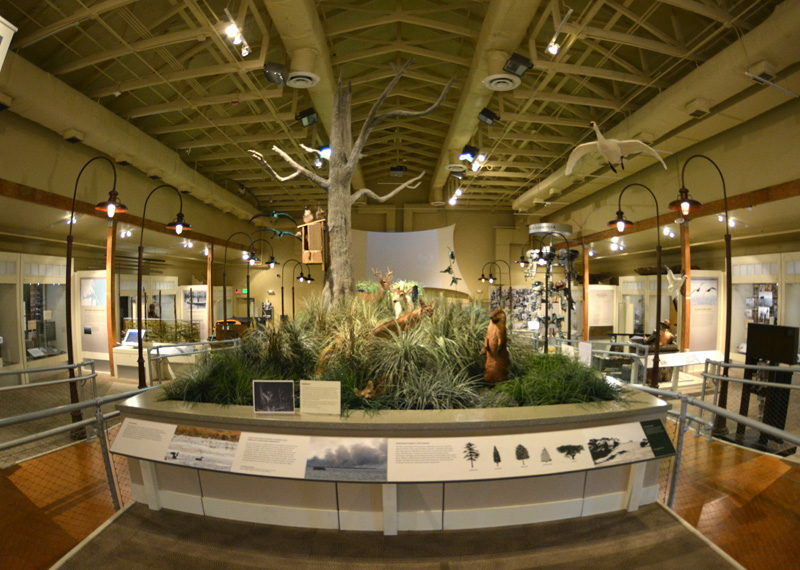 Exhibits at the Outer Banks Center for Wildlife Education pay homage to the area’s wildlife and history, and include an 8,000 gallon aquarium, a large decoy collection, an auditorium with a short film about the landscape, and a collection of other interactive displays. When was the Outer Banks Center for Wildlife Education built? The Outer Banks Center for Wildlife Education is a relatively new attraction, and was officially opened in 2006. What attractions are close to the Outer Banks Center for Wildlife Education? Where can you stay near the Outer Banks Center for Wildlife Education? There are hundreds of vacation rental accommodations that are close to the Outer Banks Center for Wildlife Education, and which can range from condos to towering vacation homes. In addition, the town of Corolla has a number of hotels and resorts for visitors. What are the special events at the Outer Banks Center for Wildlife Education? The Outer Banks Center for Wildlife Education hosts a wide range of special events throughout the year, and especially in the summer season. Geared towards visitors of all ages, the events are typically free and can include kayaking or fishing exhibitions, craft projects, lectures and talks, and special presentations by guest speakers. Are there kids programs and exhibits at the Outer Banks Center for Wildlife Education? The Outer Banks Center for Wildlife Education is a perfect destination for kids to learn about the local wildlife of the Outer Banks. The center has a number of interactive exhibits designed for kids, and hosts a range of kid-friendly programs throughout the year, and especially in the summer months. Are there walking or hiking trails near the Outer Banks Center for Wildlife Education? The Outer Banks Center for Wildlife Education has an exterior boardwalk that leads to the Currituck Sound, and which offers fantastic views of the open water and surrounding wildlife. The outdoor area also borders the Historic Corolla Park, and is a great destination for picnics, watersports, and just enjoying the natural surroundings. Is there a gift shop at the Outer Banks Center for Wildlife Education? The Outer Banks Center for Wildlife Education does have a gift shop on-site. What are the museums in Corolla? Museums in Corolla include the new-in-2006 Outer Banks Center for Wildlife Education, the Wild Horse Museum, the Whalehead Club, and the original keeper’s quarters / museum at the Currituck Beach Lighthouse. Call 252-453-0221 for current hours.